Question: I have a problem casting big, heavy flies. I get lots of tailing loops and wind knots, and I worry about getting hit by the weighted projectile every time it comes by my head. What’s the secret? Answer: Heavy flies present casters with several troubling problems. We are all taught that good casting means throwing nice, tight loops and that high line speed makes for longer, more accurate casts. When there’s a lot of weight at the end of the line, however, you need to rethink these rules. If you throw tight, fast loops with a lot of weight at the end of the line, the results are shocking…literally. At the end of every forward- and backcast the heavy fly acts like a running dog hitting the end of its leash, bouncing backward. This sends shock waves down the line to the rod and screws everything up. When the fly bounces back at the end of your backcast, for instance, it introduces slack into your leader, which keeps you from achieving smooth acceleration. This often results in tailing loops that cause knots and rob you of accuracy. This slack in the line also causes you to lose control of the heavy projectile, which endangers your person and your fly rod. Given a little slack, the fly drops toward toward the ground in midcast, which also causes problems—especially if it lines up perfectly with your skull. 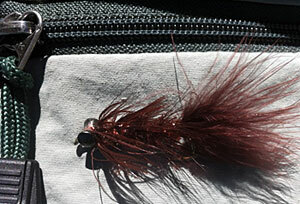 The key to casting big flies, then is to slow everything down, widen your loops, and avoid sudden changes in direction. To accomplish all these, you need to learn the Belgian cast (also called the oval cast). Rather than moving the fly back and forth along a two-dimensional plane, the Belgian cast keeps the fly moving at all times through a three-dimensional pattern. This means that there are no shocking stops, extra slack, or dropping fly. To perform the Belgian cast, you make a sidearm backcast and then a forward cast over the top, with a nice, wide loop. The name oval cast comes from the fact that, if viewed from above, your rod tip describes an oval, rather than a straight line. When you are making the Belgian cast, line speed is not important, but you must keep the line moving at all times to keep the fly from dropping. For a complete lesson on the Belgian cast, check out Macauley Lord’s excellent article on Midcurrent.